Corner Toilets For Small Bathrooms - Make Your Small Bathroom Look Bigger! There are situations in life when you need something else then the usual solutions. One of those situations is having a small space and wanting or needing to install a toilet in it. If you have recognized yourself in this description then you really need to consider getting this very helpful home element: corner toilets for small bathrooms. Basically it is a corner tank on top of regular toilet base. It is the triangular shape of the upper tank that got them their name, since it fits perfectly into a wall corner. Why Use A Corner Toilet? The most obvious reason is to save space. At this moment you may wonder if corner toilets for small bathrooms really do save any space? Well, if you take a look in your bathroom or just imagine it in your head, then in most cases you will notice that the bathroom corners are really just empty space that begs to be used. Almost all bathroom plans have a problem with space corners. And if you have a tiny bathroom then this unused space is a luxury that you can’t afford to have. Every inch counts when you are dealing with a small space. I myself have a small bathroom and I wish I had known about corner toilets. I could definitely use one but since everything is installed and pretty new I guess I will wait a few years before I consider doing some renewing. sometimes the space itself will not allow you to install anything else but a corner toilet, if you want to create a bathroom out of a tiny space. It can literally be the only solution for a small bathroom. it looks amazingly good! Even cute if you can say that for a toilet. It will add to the space esthetics and you just wait when the guests start arriving and start expressing their surprise. You will definitely have at least one “wow” moment in your home. People are really not used to corner toilets. The corner placement will allow you to add more bathroom elements like a shower or some bathroom furniture that you previously didn’t have space to put in. If you have a hard time imagining how this toilet can really help you in saving space in a small bathroom I have a great graphics for you, with all dimensions of a corner toilet drawn. 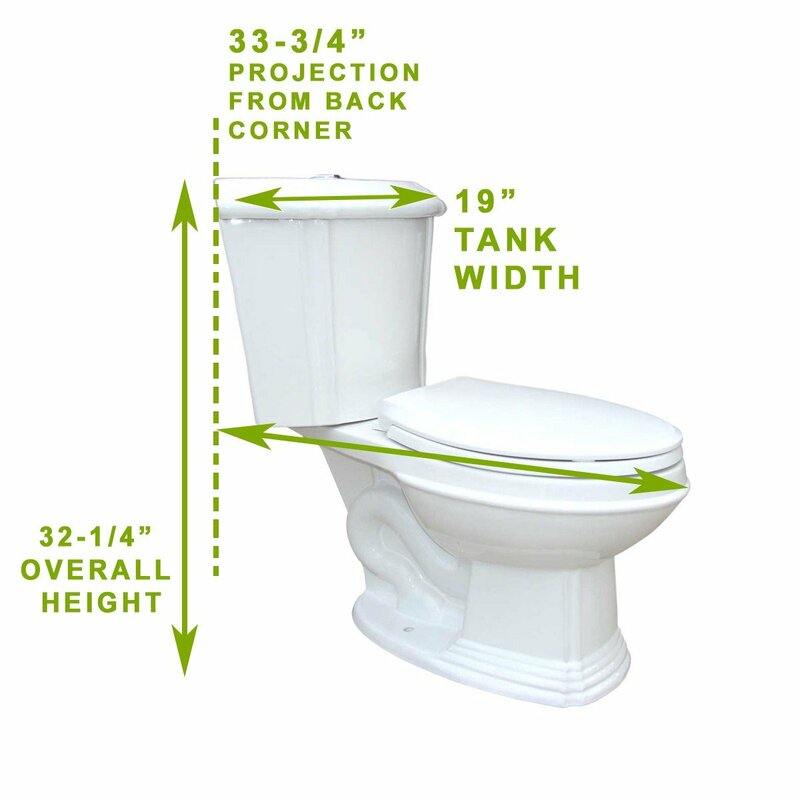 This is the drawing of an American standard toilet dimensions and will greatly help you visualize a corner toilet: click here for dimensions of a corner toilet. 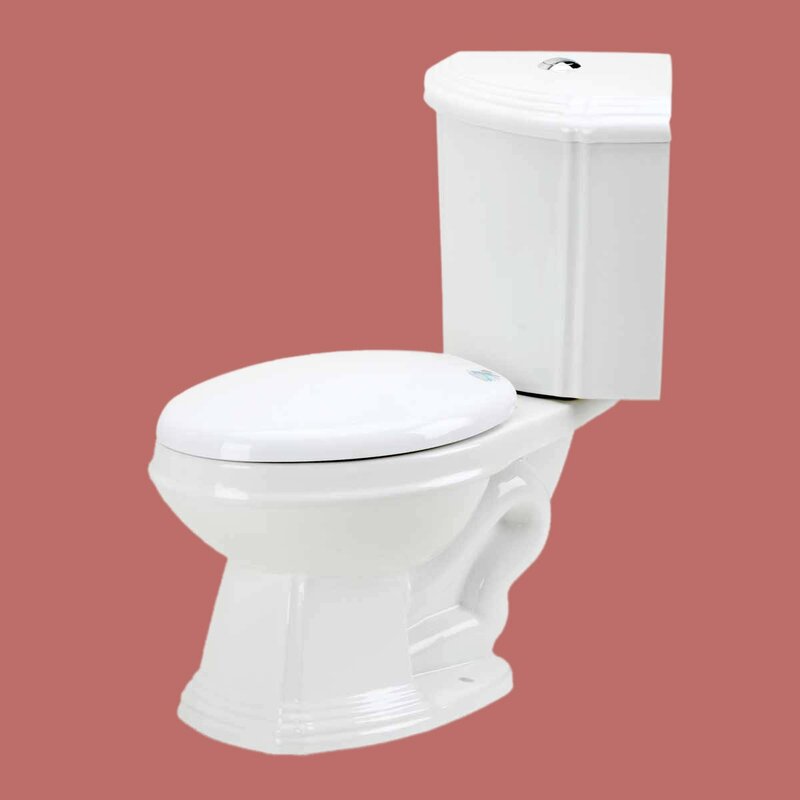 I hope that you can better understand now what are the advantages of a corner toilet, primarily helping you save space, and if you wonder where to buy a corner toilet, I have gathered a collection of best corner toilets for small bathrooms. People have been very satisfied with them, as you can check from the left reviews. You may have a hard time finding a corner toilet in your local stores so if you want one please check the ones presented here. This corner toilet certainly looks elegant with it’s elongated shape. It will be a perfect fit for any modern bathroom – even if you have a small one, it will allow you to make a proper use of that free corner space for getting some extra space. – It includes the standard two pieces that make a toilet: a tank and a bowl. The tank is of course designed to fit in a corner. – It has a standard white color which is appropriate for almost every bathroom. The white color just adds to the clean look of a bathroom. – Ever Clean antimicrobial surface (and this is a feature I like most, besides the triangular shape of the tank). It is good to know that the material itself will help you in maintaining the toilet clean. – it has oversized 3 inch flush valve. Now when I first read this I had no idea what it meant so I checked a video (it’s a bit long but you can just jump through it to quickly understand what is a flush valve in a toilet. And if you already know then just skip it completely). This feature alone can really make up your mind as the large flush valve will give you a quick and effective, efficient flush in seconds! – chemical resistant flapper: it is the rubber thing at the bottom that closes the water pipe and since it is chemical resistant it will resist chlorine from water. – no toilet seat but this is a common thing when you buy a toilet. Maybe even better since you will get one according your best preferences. If you wonder how to install a corner toilet I have included a video at the bottom in the installation section. I have checked what previous customers were saying about the installation and it is very positive: a buyer has installed it in one hour, claims it is very easy and says they will even give you handles to tighten the nuts connecting the tank to the bowl to prevent you from over-tightening them and cracking something. I have found another very interesting thing about the installation: a female buyer claims to have it installed very easily with another female friend and the friend was a complete newbie in toilet installations! That should really tell you enough how easy people were able to install this corner toilet. From the same female installer you can find out that the tank actually arrived with the flushing mechanism already installed! Yes, that is a relief to know you only need to attach the tank to the bowl! You will get a new wax ring, all the hardware and seals that you need and easy to follow instructions. The flushing technology is a modern one – mostly you will need only to tap the handle to flush completely. You can hold the handle longer and it will flush longer as well. A customer said that the fill valve is exceptionally quiet. Another one was surprised how much flushing power one gets when the bowl design is a good one – something that got discovered exactly with this corner toilet. So if you need a space saving toilet for a small bathroom, and you like the shape of this corner toilet you should really consider getting this one. It is the standard American version, people have been very satisfied with the way it works and the way it looks and saves space. You can also check the reviews and see that is a very high rated product. Really an excellent small toilet for small bathroom. This is a great looking toilet that will both save you precious space and make your bathroom look nice. It comes in two pieces and customers were very happy with the packaging, no reported damages from the delivery. If you are a busy person then you will surely appreciate that it comes with a toilet seat included – this should save you some time in searching for one. It comes in standard white color which makes it fit for all kinds of bathroom style. 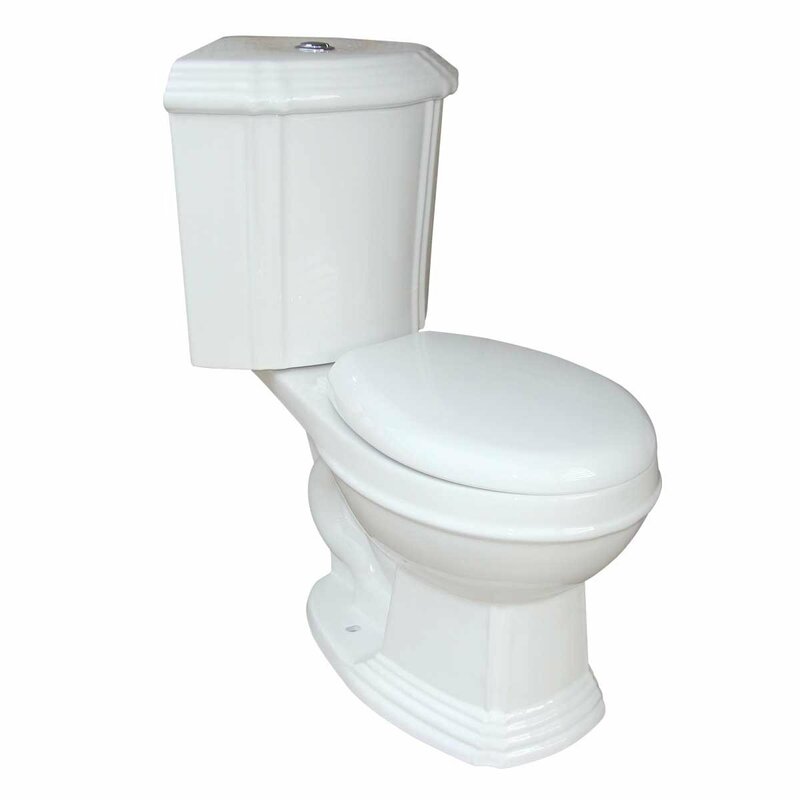 This corner toilet rough in dimensions are 12 inches – which is the standard rough in distance for corner toilets. The bowl is round, made out of porcelain, and the flushing mechanism is on right side of the tank. This toilet is designed to be eco-friendly, which means it conserves water and helps your wallet at the same time! Another feature is the dual flush system (explanation here). But as I have checked, people who bought it claim the dual flush is appearance only and that you actually won’t get a dual flush mechanism. There are far too few reviews for conclusion on this point. But even with this statement this product is very high rated and shows customers were overall very satisfied. Maybe the price plays the key role so go check it out and see if it fits your budget. It really is a nice corner toilet and people have been happy to buy it. This is a truly lovely looking corner toilet! Very unique design and very stylish. Nothing standard about this one – that’s for sure. I just love the round toilet seat, it gives the whole toilet a soft look. And just check the ripple circles on the bottom, around the bowl and the vertical ripples on the tank. The creator has certainly thought of making this toilet unusual. Besides the fact that this toilet fits in the bathroom corner and will save you space, it will give you a very pleasant view and will make your bathroom more stylish. It’s definitely my second favorite toilet (just check the black beauty below, that’s my number one choice – if I only had a bathroom that would look good with a black toilet. But you never know, maybe I will get one someday). Another great thing about this corner toilet is the flush button located on the top of the tank. It’s very handy as with handles on the side you may feel a bit uncomfortable and maybe have some problems with it being too close to the wall. But the push button on the top of the toilet tank just seems very natural and very convenient. Nothing sticks out, really a good solution for a corner toilet. I would have almost forgotten to say that this toilet has one particularly practical thing: it comes with a soft close toilet seat included! This toilet just has no flaws according it’s description. I really hate when in the middle of the night my toilet seat falls by accident and wakes everyone up. With this one you won’t have to worry about the noise. Great if you have kids in the house or a partner sensitive to noise. A few other features you might be interested in knowing: it’s a dual flush toilet and is eco-friendly (which means it will conserve water as much as possible). This is also a perfect toilet for a guest bathroom: the stylized look will certainly make an impression on them. If you are remodeling your bathroom and you want to make give it an original look then you should really consider getting this corner toilet. It is true that for small spaces black is the worst color to choose for home elements. But if you want to try something unusual or excentric you can try this black pearl here. It is true that you will have to carefully think about the tile color and the rest of the bathroom elements, but that is certainly a fun thing to do. This black toilet is not for everybody. Only for the ones who like experimenting new things and who like t distinguish themselves among others. 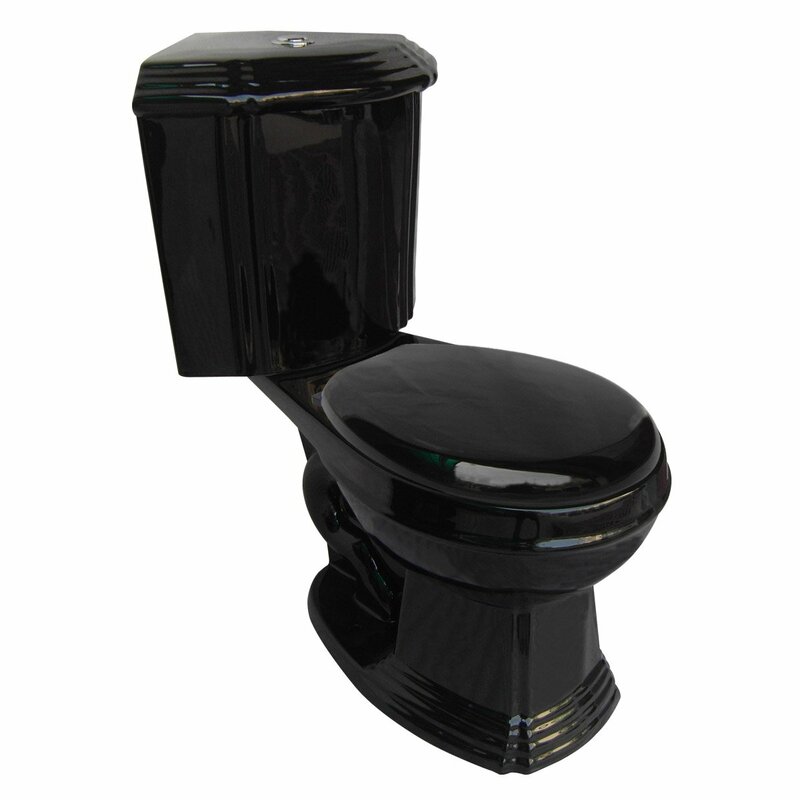 This black corner toilet will give the home a mysterious note and a luxurious touch. I mean how many black toilets have you seen? I know I have none! So you will definitely stand out and make your home something special. It is also perfect for a guest bathroom in bigger homes. If you take a closer look you will notice that the design is the same as the toilet described above, only this is the black version. How much difference can a color make! If I had some extra money for little experimenting I would definitely try this black toilet – it would be so fun decorating the rest of the bathroom! 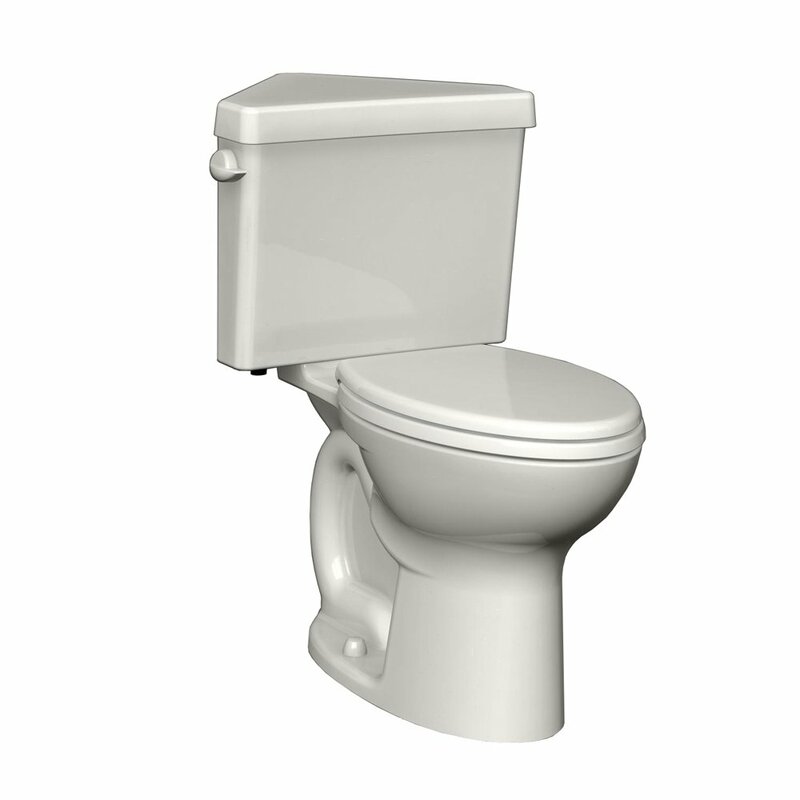 A quiet closing toilet seat – I think this should be one of the top things to be considered when choosing a toilet. Who likes to be waken up in the middle of the night by a loud toilet seat slaming? Quit, gravity flush – another point for being a quiet toilet. I know in my building I can hear my neighbor’s phone alarm in the morning. If you live in a place like mine that you will appreciate quiet things for your home. Water saving toilet – everybody likes saving money where possible, and this toilet will save you money with its water saving design. I like money saving things in my home – in the long run it can add up! In conclusion this black toilet will make an impression on people, give your home an unusual and unique style, do the job and save you money. 2 What Is A Corner Toilet? 3 Why Use A Corner Toilet?